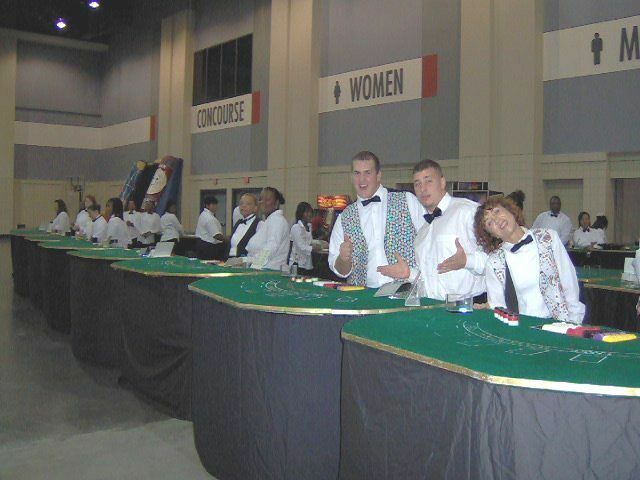 Casino Themes - Bring the excitement of a Casino Theme Party to your next event. It's a sure way to get everybody involved. We carry all the popular games - Blackjack, Roulette, Craps, Wheels of Fortune, Chuck-A-Luck, Poker (including Texas Hold 'em), and Baccarat. In addition, we also offer video horse racing and table top horse racing. Based in metro Atlanta, we service all of Georgia, South Carolina, North Carolina, Tennessee, Alabama, and parts of Virginia, Florida, and Mississippi. Whether it’s a corporate event, fund raiser, birthday party, or any other type of special event, a themed casino party is the most interactive and fun event you can have. We offer full-service casino parties, table rentals only, and every choice in between.